Travelling with young children, bulky luggage, or to a tight schedule? Swap the transfer bus for the ease of arrive-fly-parking with Good To Go Meet & Greet at Terminal 5. There's no faster way from car to check-in desk. There's no need to catch a transfer bus, simply take a two-minute walk to the nearby terminal. While you’re away, your car will be parked in a security-protected on-airport car park for the duration of your trip. 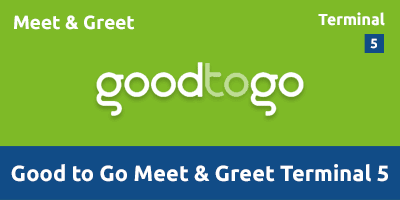 Good To Go Meet & Greet T5 is suitable for Blue Badge holders. Stays at this car park must include a Saturday night. If you are using a sat-nav, please enter the postcode TW6 2GA. Leave the M25 at Junction 14 following signs to Terminal 5 and Short Stay car park. At the T5 roundabout take the second exit, go up the ramp and follow signs for Level 4. Enter the car park and follow the signs to Off Airport parking. Park in the Off Airport area where a Good To Go Meet & Greet Captain will check your car in. Approach the barrier on Level 4 and take the ticket with your car and booking details printed on it. Follow signs to Off Airport Parking and park in one of the dedicated bays. Register your arrival at reception where staff will check-in your car. All done! Unload your bags and make the short walk to the nearby terminal. We recommend that you bring a copy of your booking confirmation with you. After landing, simply collect luggage and make your way back to the Good To Go reception on level 4 of the Short Stay car park. Your car will be ready and waiting for you to collect. In the event of any problems, one of the car park’s 24-hour staff will be pleased to help.